On Monday, the University of Notre Dame filed suit against the Obama administration over its rule that all employers must offer contraception in their insurance plans. Notre Dame is now the seventh religious college to sue over the mandate; it's also the largest school to do so. 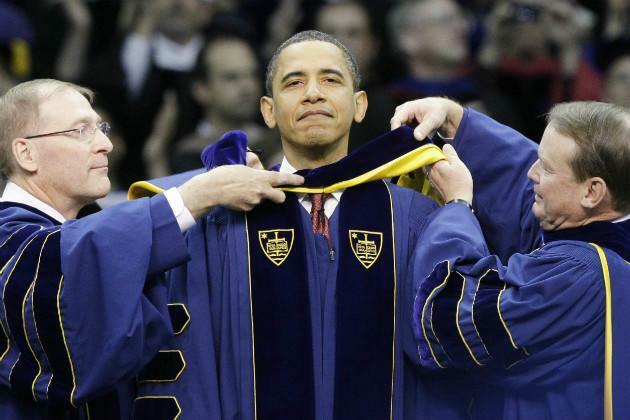 President Barack Obama gave the commencement address at the prominent Catholic university in 2009. In its suit, the school says that health care reform's contraception mandate violates its religious freedom and would require it to go against Catholic principles by offering contraception and sterilization to students and faculty in its insurance plan. The university serves 11,500 students of different religious faiths, and is traditionally led by a Catholic priest as president. A few dozen Catholic dioceses and other religious organizations also filed suit today. The Obama administration announced in February that religious organizations such as schools and hospitals would not directly have to offer birth control to their employees. Instead, the insurance company would contact women covered by its plan and offer the contraception. The U.S. Conference of Catholic Bishops and other religious organizations objected to this, saying that the organizations' premiums would still be helping to pay for the contraception in that scenario. In its suit, the University of Notre Dame says it is self-insured, which means this accommodation would not work for it. A spokeswoman from the Department of Health and Human Services told Yahoo News that she couldn't comment on pending litigation, but that the department is still forming its contraception rule for self-insured religious schools. In a statement, Notre Dame President Father John Jenkins said he will continue to negotiate with the Obama administration on the rule. "We will continue in earnest our discussions with Administration officials in an effort to find a resolution, but, after much deliberation, we have concluded that we have no option but to appeal to the courts regarding the fundamental issue of religious freedom," he said. Employers' insurance plans will have to offer birth control without a co-pay starting in August, but religious organizations will have another year before they must do so. Churches are exempt from the rule entirely. When asked for a comment on the suit, the White House directed reporters to a transcript of Obama's February remarks about the mandate.